New Sessions just added for Fall (see more details below). Space is limited, advanced registration is recommended. Free with $5.00 admission to the Arboretum; UCSC students free. Study the science of the seasons: be a part of a national effort to monitor the effects of climate change. Phenology: nature’s calendar - phenology is the timing of life cycle events, for example: when plants first bloom, birds migrate, and insects hatch. Monitoring phenology is important: changing phenology is a key indicator of climate change. It is a hot topic in climate change research. You may have even observed phenology change without realizing it, like if you noticed plants in your garden blooming earlier during warm years. 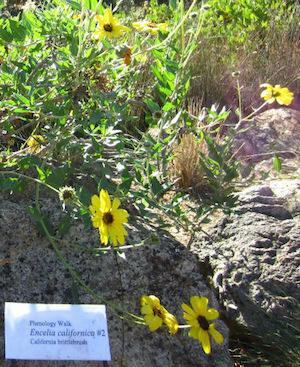 YOU can collect phenology data and contribute to climate change research: The Garden Phenology Walk gathers data on seasonal changes in plants including when they leaf out, flower and form fruit. 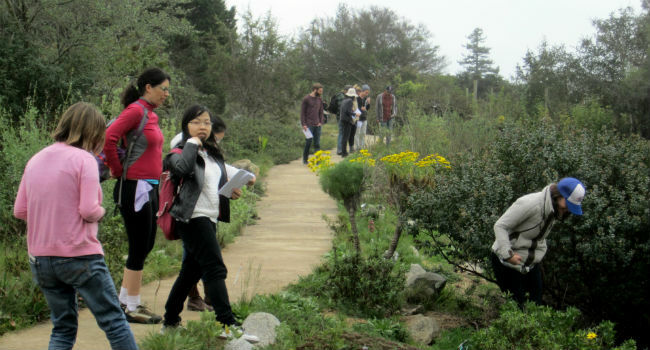 Help us monitor 18 permanently marked California native plants while touring the beautiful Native Plant Garden. Your data will be uploaded to the USA National Phenology Network’s (link to USANPN) database for use in research, policy and land management. Help us collect data:Come to a workshop: Phenology researcher Karen Tanner provides hands-on data collection training. Note: New time slot for sessions. Space is limited, advanced registration is recommmended. April 14, Sunday, 11 am-1 pm. Please check in at Norrie's Gift & Garden Shop. May 11, Saturday, 11 am-1 pm. Please check in at Norrie's Gift & Garden Shop. June 15, Saturday, 11 am-1 pm. Please check in at Norrie's Gift & Garden Shop. Pick up a booklet, map and data sheets (words are links to .pdf files) at the entrance to the Native Plant Garden. Collect data by following the instructions in the booklet. Fill out the datasheets and drop them in the dropbox at the entrance to the Native Plant Garden. Please return the booklets and maps so other people can help us collect data too! 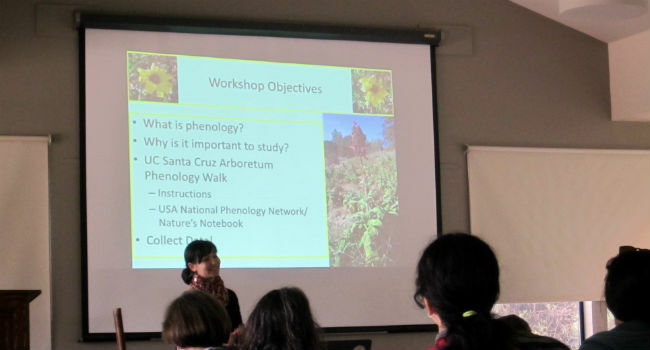 Q: What is the USA-National Phenology Network? A: The USA-NPN is an organization that develops standardized protocols for collecting phenology data. Then, researchers, students, volunteers and community scientists use these protocols to collect phenology data all across the USA. This data is managed by the USA-NPN and is used by researchers, land managers, and policy makers. Also, all the data is available to the public. Visit https://www.usanpn.org for more information. Q: Why is it important to monitor the same individuals and plots from year to year? A: By monitoring the same individuals and plots from year to year we can assume that any phenological changes we observe are due to environmental change over time, and NOT due to the location or genetics of the plants. Q: Why monitor multiple individuals for each species? A: Scientists require replication to ensure results are consistent. This also accounts for differences due to the locations of the plants. Q: Why monitor species year round, even when they are dead or dormant? A: This is important information too! It provides information about the length of the growing season, like whether plants are dying earlier in the season, or if the dormancy period is longer. Q: I am using the Nature’s Notebook app and see that some phenophases are not included in the booklet and datasheets provided by the UCSC Arboretum. Why are some phenophases included, but not others? A: We only included the phenophases that we thought were unambiguous and simplest to record data for. However, if you want to record all the phenophases in your Nature’s Notebook account, please feel free to do so.